Both, Juergen and Gitti attended school for six months in the Fall and Spring of 2004/2005, respectively, to study for their 100 ton master license. They both passed all tests with flying colors and received their licenses in the Spring of 2005. Since then, they are both officers of the US Merchant Marine. Captain Juergen: ever since he was a student in Hamburg and sailed on the city lake, the Alster. "Real" sailing only began in the US in 1976 after we bought our first Impromptu, an O'Day 25. Crew (navigator, helms(wo)man, cook, etc. ): Gitti: since 1976 after we had purchased our first boat, the O'Day 25, Impromptu. 3 round trips to Bermuda, 2 on our CAL 39 and 1 on our Hallberg-Rassy 46, many trips to Nantucket, Martha's Vineyard, Block Island, Newport, Cape Cod, Cape Ann, the Chesapeak Bay, New York City, lots of sailing weekends within and beyond the Long Island Sound and, meanwhile, our crossing of the Atlantic from Montauk, Long Island, via the Azores, to England and from there across the Channel to Belgium, Holland, Germany, Denmark, Sweden and back, crossing the Channel a total of 3 times, the last time from the Isle of Wight via Guernsey to France, Southwest from there through the Channel, along the Britanny Coast to La Rochelle. Back in the US with Impromptu (after a huge delay by Dockwise), we sailed for about 2.5 months in the Bahamas, enjoying Grand Bahama island with its wonderful marina at the West End. We sailed the Abacos and got to know almost all of the islands in that island group before heading up North to Charleston, SC, and from there, back to our home port (Milford, CT). The summer was spent - when sailing - in local waters for reasons, some of you are aware of. I won't bother those of you who don't know. As of mid November of 2007, Impromptu was transported to St. Thomas, USVI where we met up on November 18 and began an unbelievable six plus months sailing from the USVI to Martinique, St. Lucia, Dominica, Guadeloup, Antigua, Montserrat, Nevis, St. Kitts, St. Barth's, Sint Maarten and from there to the BVIs, visiting the islands of Peter, Tortola and a few others before heading back North, home, via Bermuda. We have still not counted the miles we have traveled on Impromptu since we took her to the Bahamas. Some day, we will. 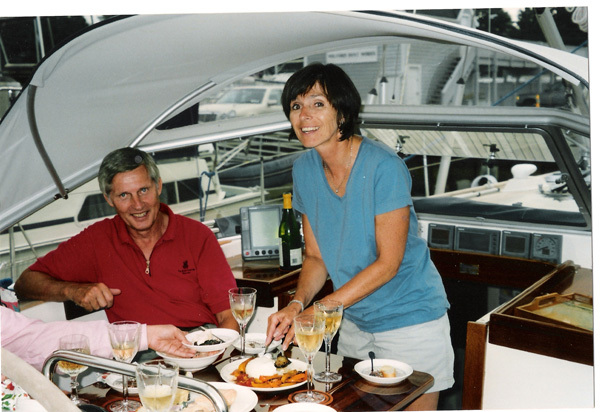 Over the years, we have experienced a number of storms, innumerous gales but also wonderfully pleasant days at sea. We still love it, despite my seasickness, and we hope to keep sailing, albeit in more local waters, for many more years.